Good news for all Bitcoin fans because the latest rival to DavidNews.com monitor is another Bitcoin-only HYIP called Bit Bonum. The project has joined Sticky Listing on our monitor 7 days ago and has been online already for 16 days in total. Now I’m keeping in the program $400, to monitor the performance of it. Let’s see how it is going to perform in the future and what this HYIP is offering us. I believe there are many HYIP name ideas, which have been inspired by Bitcoin. In fact, you can take look at the monitor and see that currently, we are monitoring 3 programs, which might be somehow inspired from Bitcoin. Yes, Bit Bonum is one of them. Right now, I have opened the home page and want to dig a little bit deeper into the details and would like to share my first impression of the website. I would place this website into a category of space-themed website design. It just looks futuristic in some sort of way. Of course, Bitcoin is also still futuristic currency for some people out there. Therefore, this design fits perfect the overall Bitcoin-only approach. Even though the overall impression is futuristic, overall layout and content structure look very simple and logical to me. I can see here information explained in a simple manner for both beginners and advanced players. Moreover, most important information regarding investment plans, security (SSL certificate, Andi-DDoS protection) is right on the home page and can be seen without much extra scrolling or swiping. In terms of swiping, this website is mobile friendly, which is crucial for any kind of website these days. I did also try functionality on smartphone and must admit it works well. Bit Bonum admin has done the homework by registering a company for this HYIP and any user can easily compare preview of the certificate (about us page) with information available on Companies House website. Of course, I have already mentioned several times in previous reviews that company registration doesn’t provide any security of your investment. It’s just assumed as a standard in the industry, which some players choose to follow or not. 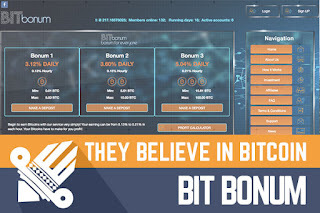 Anyone can choose one of the 3 different investment plans offered by Bit Bonum. HYIP is offering three different plans - Bonum 1, Bonum 2 and Bonum 3. Of course, minimum deposit and daily % rate is changing according to the plan. Minimum deposit of 0.01 BTC and interest rate of 3.12% a day on the first plan and 10.01 minimum deposit with 5.04% daily rate in the last one. As usually, I want to do a quick calculation. In fact, I realized it’s better to avoid converting Bitcoin to USD for Bitcoin-only projects due to changing rate of the Bitcoin currency. There is a functional calculator on the website, but I still would like to provide a calculation for you, to understand that it’s important not to calculate only the daily profit, but also understand how many days it takes to reach the break-even point. Especially, in HYIP’s like Bit Bonum focus only on the daily payments, which is the real profit. Investment of 0.06400 (now equal to 150 USD) would fit requirements of investment plan Bonum 1 with 3.12% interest rate. Such deposit would generate 0.00199680 BTC a day and would reach the break-even point after 33 days and start making a profit only after a 34th day. The program has been online for 16 days altogether and first-day deposits made in the first plan will start earning only after another 18 days (from today). Of course, the break-even point depends on the chosen plan, which is based on the amount of the deposit. It looks like I have already covered the most important facts about Bit Bonum here. Even though the program has been online already for 16 days, I couldn’t find anything unusual about it on message boards. If you do, please drop a message in the chat box. In the meanwhile, I must admit Bit Bonum has a website with very simple structure and design, but it doesn’t lack any crucial information or functions on it. Profit calculator is simple to understand with hourly, daily and monthly profit calculations. The company has done a homework by registering the company. Unfortunately, the first investment plan of Bit Bonum hasn’t yet made one full investment cycle, which often is a reality check for some HYIP’s. Therefore, all we can do is wait and see what happens next. As always keep in mind that all HYIP’s are highly risky and you are the only person responsible for your investments. Therefore, if you ever decide to make any investments, don’t invest more than you can afford to lose! Investment plans: 0.13% hourly (3.12% daily) up to 0.21% hourly (5.04% daily) for an unlimited time, deposit possible to withdraw anytime after 24 hours. YoBit enables you to claim FREE COINS from over 100 distinct crypto-currencies, you complete a captcha one time and claim as many as coins you need from the available offers.